The first tree that is honored in the of cycle of the Celtic Lunar Month Calendar, according to the Beth-Luis-Nion system, is the Birch. The celebration began on December 24th and lasts until January 20th. Birch, considered the "Lady of the Woods" and the divine mother in Celtic lore, bestows to us the divine Sun. During her lunar reign we celebrate the Winter Solstice marking the return of the light. Alternately it is also associated with the return of the bard Taliesen (The Merlin) who is birthed by the Goddess Ceridwen. The bark of the Birch tree is what designates the color association and species such as Silver, Black, Yellow, White and Red. 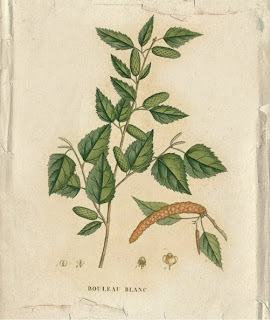 The paper-like quality of the bark was utilized for writing as well as medicinal preparations. In herbalism the leaves are infused in water and drank daily as a tea for the prevention of bladder and kidney stones. We find the Birch primarily in Northern America, Asia and like all the trees in the Ogham calendar Europe. The species prevalent in the time of the Celts was the silver species Betula pendula. The animal totem most often associated with the Birch is the white stag. The teachings of this elegant and graceful tree, represented by the letter "B" for Beith, center on new beginnings and rebirth. The birch is the first tree to begin anew in a forest devasted by fire as well as the first tree to sprout leaves after a long winter. When I first began studying aromatherapy in the nineties essential oil of Birch, Betula lenta, was found in all the aromatherapy books. Lately I have noticed that the essential oil has fallen out of favor. A true Birch essential oil is 98% natural methylsalicylate, which has the potential of irritating sensitive skin and is toxic orally. Regrettably the toxic, synthetic methyl salicylate is often used as an adulterant to the true essential oil. However, according to the Dermatology Database, sweet birch oil has been found to be a non-irrritant when applied to human skin. Personally I have used sweet birch here at home and in my aromatherapy preparations for pain relief with great success and no side affects. For a attunement with the sacred Birch take a moment to walk amongst a grove, with a quiet and peaceful mind. Be on the lookout for any gifts the tree may bestow on you. If you find fallen branches gather them for creating a magical wand. The color red is most often associated with the magic of the Birch, thus red candles, ribbons, fabric, etc work well for the creation of wands and pouches. For a magical potion consider a true essential oil of sweet birch, frankincense, rose and benzoin. I will be back shortly with the publication of Perfume Illuminated where Beth and I will elaborate on Birch in fragrance and flavor, stay tuned.